Eureka! After 25 years and more than 50 trips to train in Japan I finally understood the footwork difference between Koto Ryû and Gyokko Ryû. Better late than never. We had a class with Nagato sensei and I couldn’t do the Oni Kudaki he demonstrated until I saw. Hatsumi sensei often speaks about mienai waza, a technique that cannot be seen. For me this, had been mienai for a quarter century. My taijutsu had been mainly influenced by Noguchi sensei. 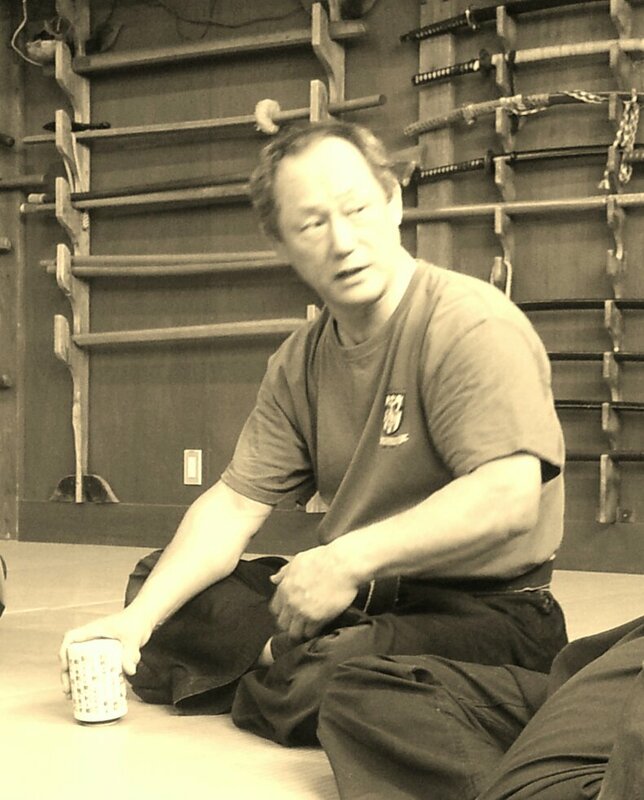 The reason for that is that Hatsumi sensei in 1993 told me to train exclusively with him and Noguchi sensei. This had been valid until the opening of the honbu in October 1997. I asked him again with whom I should train now and he said only at the honbu and with the Shi Tennô teaching there. So I began to train regularly with Senô sensei, Oguri sensei, and Nagato sensei.As you know each Shihan has his own way of moving and their taijutsu is different from one another. In the past I discovered how difficult Nagato sensei’s movement were for my taijutsu. Until yesterday my eyes were not ready to see it. But yesterday I saw the light! Each Shihan received, from sensei, some of the schools*. If Noguchi sensei was mainly influenced by the Gyokko Ryû, Nagato sensei was more info the Koto Ryû. These two schools deal with different distances, therefore their footwork is different. Also when you compare the relative sizes of both Nagato sensei and Noguchi sensei you see that their working distances (ie efficiency) will be different.The Gyokko Ryû is short distance. Hatsumi sensei told me once that the Gyokko Ryû distance was about 2 shaku (more or less from elbow to the tip of fingers). The movements are done mainly with a moguri type of feeling, moving vertically up and down, and in circles to compensate for the lack of distance. Conversely in the Koto Ryû, the starting distance is about 6 shaku. Therefore the school uses a lot of jumps forward and backward. The movements are done mainly horizontally. This basic understanding about the two schools explains partially why they merged so well together once they have been reunited**. The two schools are complementary to one another. We know that Koto Ryû uses Yoko aruki (ties in the same direction) where the Gyokko Ryû uses Jûji aruki (feet perpendicular).We know that in the Koto Ryû the body is placed sideway (profile, flat), where in the Gyokko Ryû the body is twisted upside down to meet with the lack of distance. Yesterday we did a variation on Oni Kudaki:In the technique uke was attacking right fist. Tori was controlling the space by extending the right arm in omote (no block) and positioning his body flat outside of the attacking arm. Tori has his left foot forward, his body parallel to uke’s arm.Then Tori deflects and bends uke ‘s arm and moving forward places a kind of Oni Kudaki. I’m sure that everyone understands it.I couldn’t do it because when applying the waza I was stepping forward with my back leg (right) causing my body to twist to the left (typical Gyokko Ryû footwork). Nagato sensei was simply shifting his body weight so that he would “walk ” directly with his left leg creating an automatic off balancing of uke to the rear.Then this would open what I call a typical “Nagatoism” with the usual switch of hands and death of uke. By simply changing the weight in your legs and moving the front leg instead of the back leg you keep your body in line and can walk or jump through uke. I have seen this for years but as I was focusing on the wrong thing, it is only yesterday by watching exclusively the feet that I could finally see it. I have been training here over fifty times and each time I learn new basics. This is amazing. But it makes me wonder about the teachers coming here every two or three years and thinking they understood it all. As I wrote in a previous blog article “rank is not competence” and quoting Nagato sensei yesterday during the break: “the rank you have is based solely on your own personal scale “***. I guess that some have tiny scales but it is not important because we all know that size doesn’t matter. * I think they got three ryûha each (tbc). ** at some point in History the Sôke of Gyokko Ryû having no successor asked his friend the Sôke of Koto Ryû to teach it together. And this is how these two systems, still taught separately, ended together. *** his point was to not compare yourself to any other martial artist inside or outside the Bujinkan. Thanks Arneud…. As you suggest ….We’re never too old to learn how much you don’t know….and with that understood… We don’t dwell… We don’t intellectualize…We… just ….keep…. going. nice article as usual; so every people who tells that Koto Ryu is short distance and Gyokko Ryu longer are wrong? Nagato uses very effective taijutsu. The “drop step” is a hard to do, but amazingly useful basic movement. Would it be possible to see a video demo of what you describe?